Although it looks very similar to a product I reviewed a while back, Flexispot has created version two of their very popular sit-stand riser, incorporating a few improvements along the way. 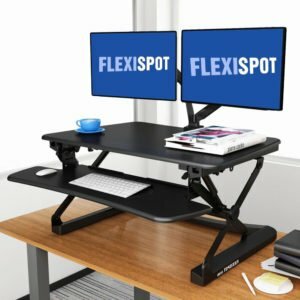 Although nothing to really take note of if you already have version one of the desk add-on, Flexispot has improved on an already good product, making it a great choice for anyone who needs the portability of a desk riser, or doesn’t want to spend at least twice as much on a full-size sit-stand desk. As of late, we have seen a surge in popularity in the segment of on-desk monitor risers (a.k.a. 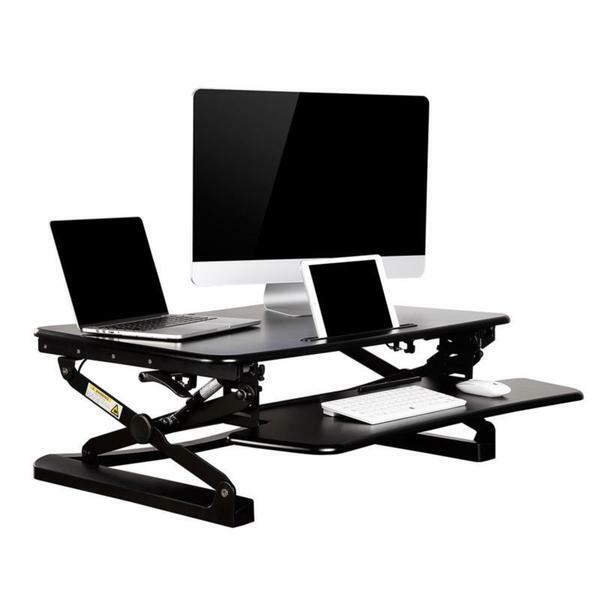 standing desk converters), such as the previously reviewed Flexispot ClassicRiser. The main advantages of these height-adjustable platforms is that they cost less, and are more mobile (than a full sit-stand desk, at least). With a height-adjustable riser, it’s easy to turn any existing work surface into an impromptu sit-stand workspace–a kitchen table, a folding table, or an old work desk. Most offer accessories that allow one to expand functionality, such as power strips, monitor arms, and document/tablet holders, which allows full use of the space provided. 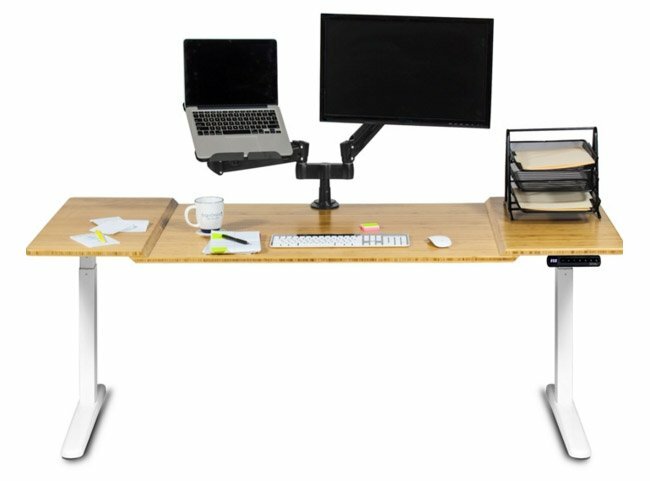 Today we are reviewing at the E-1 height-adjustable riser, a new product, from a new brand based in the U.S., TrenDesks (a.k.a. SunField LLC). If you’ve done your research into the world of sit-stand desk you’ve most likely heard of treadmill standing desks. But have you ever seen a stationary bike + computer desk combo? Well that’s exactly what Flexispot — creator of the previously reviewed Sit-Stand Desktop Riser — has come up with. Combining the aspects of a traditional exercise machine with a tray large enough to accomodate a laptop, mouse, and more, the Deskcise Pro combines the best of both worlds. 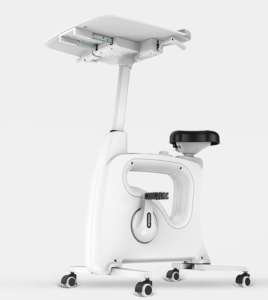 What’s more, you can even use it as a traditional standing desk by just stepping off of the bike and standing in front of the tray, much as you would with any other vanilla standing desk. It’s been quite a while since our last standing mat reviews were published, and although there isn’t a ton of innovation when it comes to mats, it is indeed time for an update on the subject! Lucky for us, the folks over at Wirecutter did much of the work for us. 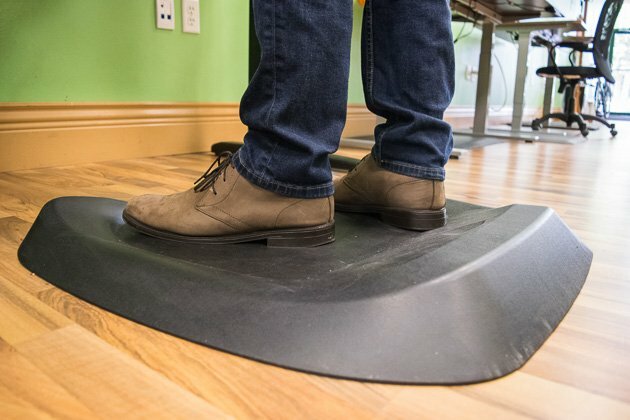 Starting with 10 contenders, their staff tested the mats in a real-world environment for hours at a time, eventually narrowing down the winners in a few separate categories. Between a traditional adjustable standing desk and something more portable, like the Roost laptop stand, or the previously reviewed Loctek SL1 Sit-Stand Laptop Arm, is this: the Flexispot Sit-Stand Riser Workstation. Whether you don’t want to spend $500-$1,500+ on a full standing desk setup, don’t want to/can’t get rid of your current table, need something a bit more portable, or just need something to use part-time, this is the standing desk alternative for you. All you need to do (beyond some simple initial assembly) is to put it on top of a table (30in depth minimum), set up your laptop and/or monitors on top of it. then you’re ready to go! Turn any desk into a standing desk–simply. 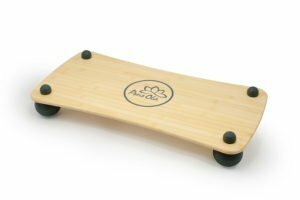 Today I’m reviewing the Pono Ola balance board, which can serve as a useful accessory alongside a standing desk. Marketed primarily as a core-strengthening tool, for use with yoga or other exercise activities, the Pono Ola can also be used as either something to stand on while working at your standing desk (in place of a standing mat), or as a way to loosen up your lower body after standing for extended periods of time (this is what I ended up doing–see below). I just came across a listing of innovative standing desk products on ProductHunt.com that may be of interest to some readers. 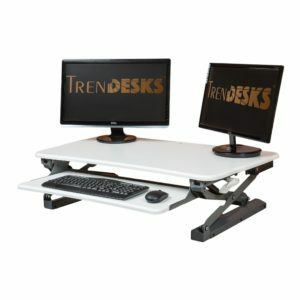 While some of the products featured have been covered here on StandingDeskReviews.com, there are many more that haven’t been (yet). Of particular note are the all-cardboard, $30 Oridesk, and on the other end of the spectrum we have the luxury, tech-enabled Stir desk (ringing in at a cool $3,000). There are also many user reviews on some of the more popular desks, which may be of use to those that are trying to decide on one standing desk or another. Check it out by heading on over to ProductHunt’s Standing Desks for Everyone. Desktops are becoming more and more scarce nowadays, as more people choose to carry around their laptops wherever they go. Even those with a fixed office or desk somewhere would rather rely on one single computer instead of dealing with the hassle of keeping a desktop and a laptop synced together all the time. And, with the speed and portability upgrades to laptops over the past few years, it’s no wonder why this is the case. If you’re lucky enough to have your own private desk at home or work, and buy an external monitor, Bluetooth keyboard and mouse, there is the option to have an ergonomic workspace without breaking the bank. There are multiple companies making products of various designs and capabilities that fulfill the task of basically raising your monitor (and often keyboard/mouse) up off of your main desk surface, one of them being Loctek. We’ve written about inexpensive standing desks before, but this one may take the cake (being about the same cost, but even easier to set up than the FedEx shipping boxes hack we wrote about a while ago). The CEO of Hootsuite–the well-known social media management software–has devised a clever cardboard “standing desk” that is lightweight and easy to travel with. Called Oristand, it consists of a single piece of folded up cardboard, it can be placed upon any existing desk or table. 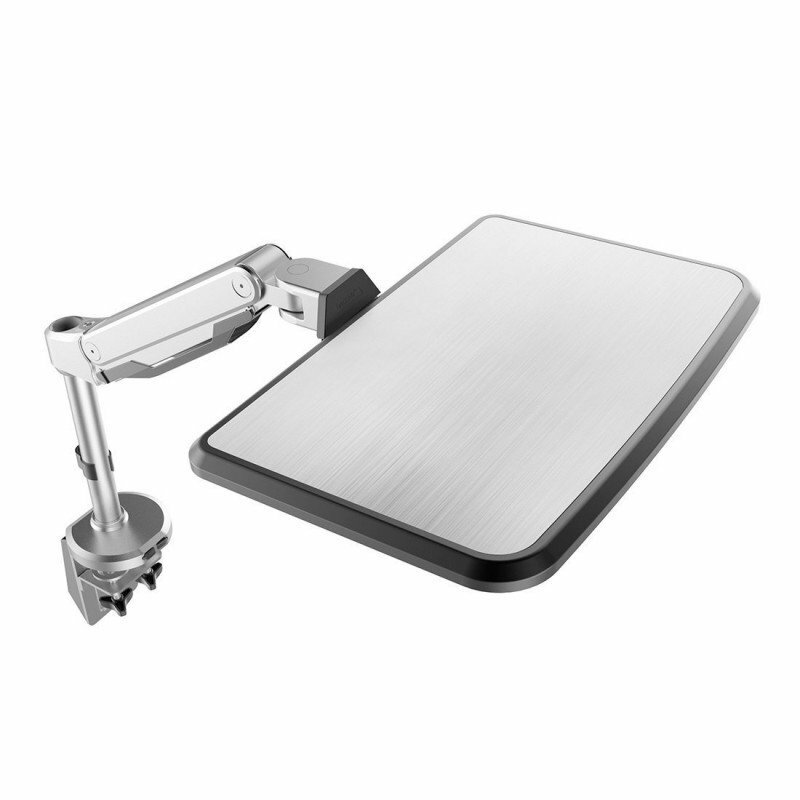 It has two steps–one for your laptop, and another lower one for your wireless keyboard and mouse (if you have them). This allows you to keep your head level, and when using wireless keyboard/mouse you keep your elbows at a 90 degree or more angle, which is generally considered ergonomically sound. Next on the review list is the highly-rated Fully (formerly known as Ergo Depot) Jarvis Standing Desk. Fully is a long-time manufacturer and dealer of ergonomically fit desks, chairs, and accessories to corporations and end-users alike. The Jarvis is Fully‘s most highly-reviewed desk, and is manufactured directly by Fully (they created their own line in 2010). This is a heavy duty, well-constructed desk. One look at the reviews–either on the Fully web site or on Amazon.com will assure you of that. Heavy-duty life capacity, a bevy of options and surfaces to choose from, reasonable price point, unmatched seven-year warranty, and fast, silent adjustment combine to make this desks one of the best on the market right now. The Jarvis desk isn’t for everyone though, so be sure to read to whole review before committing your hard-earned dollars.